This media center has clean lines to go with a modern or throwback style. This media center has clean lines to go with a modern or throwback style. 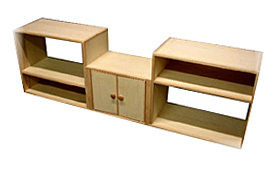 We can customize our TV stands almost any way you want it. From our large variety of sizes, doors, drawers, and moldings to the many different stain and paint colors.